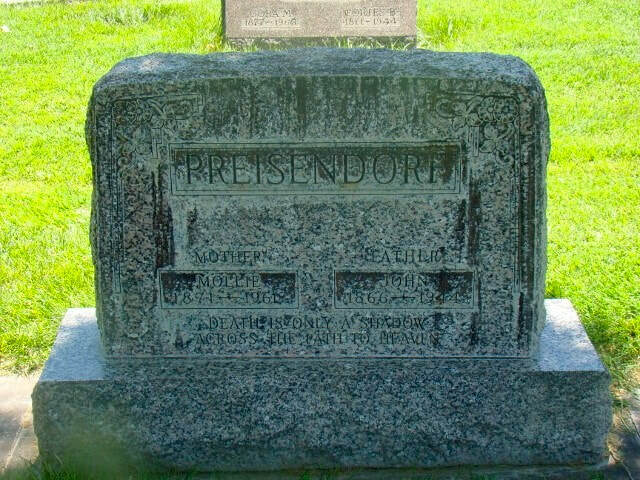 Johannes Preisendorf was born in Norka on April 18, 1866, the son of Johannes Preisendorf (born 1841) and Christina Jost (born 1843). Johannes was confirmed in Norka in 1856 by Pastor Christoph Heinrich Bonwetsch. Johannes married Amalie Brill on January 19, 1893. Amalia was the daughter of Peter Jost (born 1798) and Elisabeth Hohnstein (born 1801). Three children were born in Norka: Peter (1895-1897), Georg Conrad (1897), and Johann Georg (1899). The family of four immigrated to the United States arriving in New York on September 9, 1899 aboard the steamship Pretoria which sailed from Hamburg. Johannes (John) and Amalie (Mollie) settled in Colorado. Seven children were born in America: John (1901), Benjamin (1903), Henry (1905), Lydia (1907), Rhinehold (1909), Samuel (1912) and Helen Amelia (1915). Johannes wrote a manuscript titled "Auszüge aus der Chronik der Kolonie Norka an der Wolga" (Excerpts from the Chronicle of the Colony Norka on the Volga) which was published in Der Kirchenbote (year unknown). His account provides important information and details about the development and history of the colony. Johannes died on March 26, 1944 in Fort Morgan, Colorado. Mollie died in January 5, 1961 in Brush, Colorado. Both are buried at the Riverside Cemetery in Fort Morgan.